Stand straight with the back straight, abs tight, chest forward and legs shoulder apart. Hold the medicine ball in front of you with ball closer to your chest. For extra stretch extend your hands. Keeping the hips facing forward and the arms rigid, twist at the waist, turning the shoulders to one side. The balls should still be shoulder level, but facing the side. Your eyes should follow the movement of the ball. Return to the start, and repeat the other direction. Do 12 to 15 reps on each side. Sit on the floor with your knees bent and feet flat on the floor. 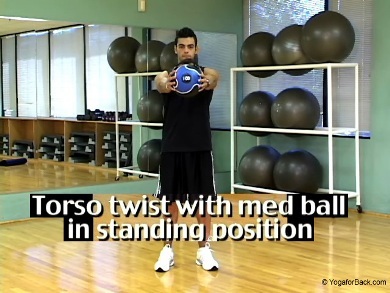 Extend your arms straight in front of you and hold the medicine ball. The medicine ball may be your choice of comfortable weight like 6lb, 8lb, 10lb etc. Tighten your abdominal muscles and lean back about 45 degrees. With your abs tight, rotate your torso toward the right as far as possible and try to touch the floor. Be sure to move your upper body (head, shoulders, arms, chest, and abs) in unison; don't lead with your arms. Look in the same direction your hands are pointing throughout the move. Hold, then return to center and twist to the opposite side. Do 12 to 15 repetitions on each side. Lie with your lower back pressed into the floor and your hands clasped lightly behind your head. Bend your knees to about a 45-degree angle from the floor. Simultaneously, lift your shoulders off the floor, and bring your left knee to your right elbow, while straightening your right leg. Then using a bicycle-pedaling motion, straighten your left knee, while bringing the right knee in toward the left elbow. Extend your legs out only as far as is comfortable without arching your back. Alternate your legs, keeping the movement slow and controlled. Go slow, focus on using just your abdominal muscles, don't pull on your neck or tuck your chin, generally these two steps are often neglected, but are crucial to fully activate the abdominal muscles. On every repetition you must lower back firmly into the floor and pause at the top position. Do 15 to 25 repetitions. Lie back on a Gym ball so that the ball is supporting your lower back, with your knees bent and your feet flat on the floor. Place your hands loosely behind your head. Slowly raise your shoulders to no more than 45 degrees. Hold, and then slowly lower. For better balance, spread your feet wider. To make the exercise more challenging, move your feet closer together. Go slow, focus on using just your abdominal muscles, don't pull on your neck or tuck your chin. On every repetition you must lower back firmly into the ball and pause at the top position. Do 15 to 25 repetitions. Lie on your back, keeping your hips and pelvis flat. Keep your both legs raised with the support of a wall or Gym ball so that your knee is 90 degrees with your hip. With your hands clasped under your chin, contract your lower back muscles and lift your chest about 30 degrees off the floor. Hold, and then slowly lower. Go slow, focus on using just your abdominal muscles, don't pull on your neck or tuck your chin. On every repetition you must lower back firmly into the floor and pause at the top position. Do 15 to 25 reps. 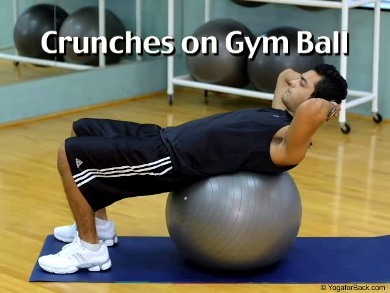 Lie on your back and hold the Gym ball in between your legs and hold it tight. Bring your hips and knees to a 90-degree angle. With your arms out to the side to help stabilize yourself, begin slowly lowering your knees to one side while maintaining the 90-degree angle. Continue lowering your knees until your thigh lightly touches the ground or your shoulder blade begins to come off the floor. Raise your legs back up to the starting position and repeat the movement on the opposite side. Stay in control of the motion - making your abdominal and oblique muscles does all the work. Focus on keeping your shoulder blades on the floor at all times as your torso and hips rotate side to side. Do 15 to 25 reps.